I thought about featuring Meghan’s look from Princess Eugenie’s wedding today, but I may wait on that. I’m in the mood for more texture and edge today! This is another one of my favorite looks of Meghan’s! From the classic tartan coat to slimming black slacks and stellar handbag, she nailed every detail. She wore this stylish ensemble to chat with well-wishers at Edinburgh Castle on her first royal appearance in Scotland earlier this year. The print choice on this Burberry coat was a nice nod to the country, wouldn’t you say? I love the color coordinated handbag too. She seems to really love the Strathberry brand when it comes to handbags, as this is the third one I’ve seen her wear! I love the tote she wore so much in this look, I recently decided to buy it myself for fall… the gold bar detail is stunning, unexpected and incredibly chic. As if the coat and bag weren’t amazing enough on their own, the outfit she wore underneath was even better… and so easy to recreate! She’s wearing some fabulous Veronica Beard pants (sadly sold out!) and a simple black turtleneck by Wolford. Such a sophisticated and stylish look for work, holiday get-togethers with friends, and more! This is a look I definitely would like to recreate myself this fall/winter season. 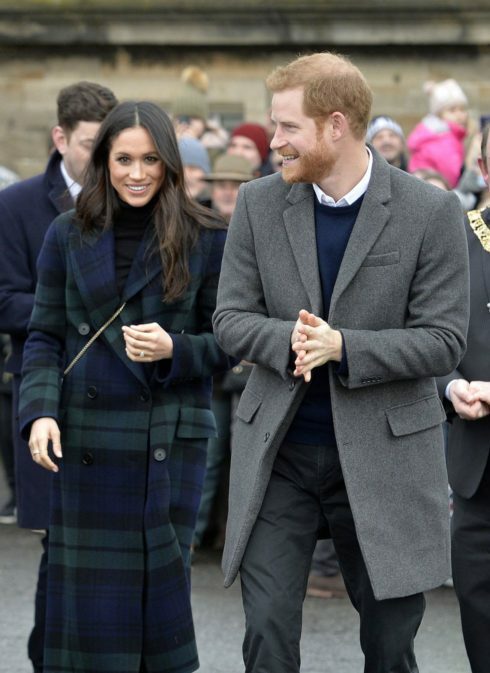 While her Veronica Beard pants and Burberry tartan coat are officially sold out, I did find quite a few similar styles which I’ll link below! The closest match to the tartan print on her coat I could find was this style! It’s a shorter coat, but the colors are nearly identical. Still an investment, but I always find quality outerwear to be worth the splurge. 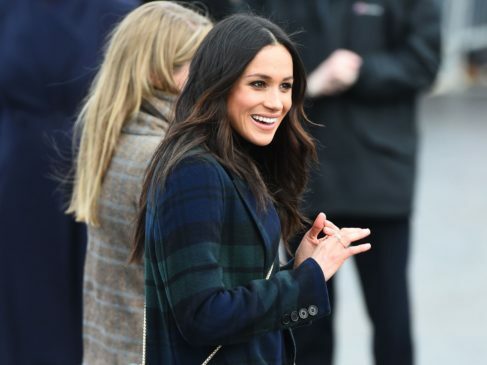 This coat from the collage is the same length as Meghan’s, but the tartan has a thin beige stripe in addition to the navy, black and green tartan. Also pricey. The cheapest alternative I could find was this style for only $64! Only a couple of sizes left. This coat is under $200 with a pretty plaid print and a similar neutral color scheme. This coat is Burberry and with a similar print, but a completely different color scheme (that I LOVE)! I found lots of alternatives for the pants! The investments are here, here and here. To get the pant look for less, try this pair, this pair or this pair. All under $100! Try the green crossbody look on a budget with this (under $50), this (under $100) and this (under $200). This turtleneck is nearly identical to Meghan’s, but for only $59! 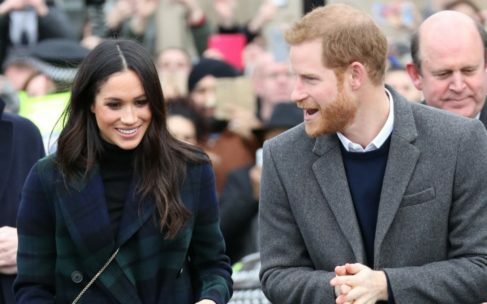 PS: Can you believe Prince Harry and Duchess Meghan’s royal tour begins TOMORROW?! I cannot wait. 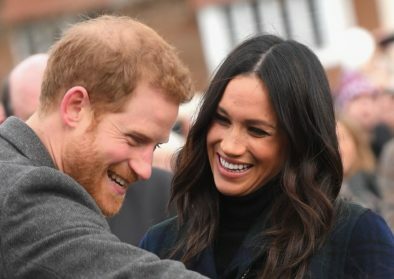 You can expect no less than 76 public appearances from the Duke and Duchess of Sussex on the 16-day long tour of Australia, Fiji, Tonga and New Zealand. I also heard that Meghan may not be visiting Fiji with Prince Harry…. as in the one country where Zika is problem – cue the pregnancy speculations!!! I may be doing more than just three looks per week to keep up with their busy schedule, so stay tuned for a royal-filled couple of months starting on Wednesday!!! Looks like we jumped to outfit #9, will additional outfits be posted? That was just a typo! Posts go up every Monday, Wednesday and Friday.